Leaves that change color may be few and far between in Southern California, but there is one true sign that summer is over and fall has begun: The L.A. Phil makes a majestic annual migration from the Hollywood Bowl back to the Walt Disney Concert Hall to settle in for a season of amazing performances. And while technically autumn might have started last weekend, we’re saying it actually starts Tuesday night, when the musicians of what The New York Times calls “the most important orchestra in America” rosin up their bows and polish up their brass for opening night of the 2017/2018 season. There is so much to take in this year—nearly 170 performances, running from September to June—that we’ve picked out a few must-sees to help you find where to start, with something for everyone, from symphony lovers to pop music fans, and Hamilton-heads to avant-garde obsessives. To open the season in style, scramble to find a last-minute ticket to this gala concert. Gustavo Dudamel will conduct the L.A. Phil and soloists Jean-Yves Thibaudet, Yuja Want, Anna Prohaska, and Tim Mead through a program of Mozart’s early compositions (essential for you hipsters who really preferred Mozart before he was cool). Tickets for the concert run $99 to $306; VIP gala packages including cocktail receptions and dinners are available starting at $1,000. Presented in conjunction with Pacific Standard Time: L.A./L.A. this six-performance festival celebrates a diverse mix of contemporary music from Mexico City. Film-music lovers will flock to a screening of the film Birdman accompanied by live score performance or a night of selections from a variety of beloved Mexican movies. Pop and rock fans will enjoy concerts from Latin Grammy-lauded singer-songwriter Natalia Lafourcade, the band Mexrrissey, who reinterpret The Smiths and Morrissey with Latin sounds, and Café Tacvba, considered one of Mexico’s greatest rock bands, playing in collaboration with a Dudamel-conducted L.A. Phil. And for those who like their sounds a bit avant-garde, the festival concludes with a night of new music, including the world premiere of a composition by Juan Felipe Waller, commissioned by the L.A. Phil. Performances are ticketed individually, with prices ranging from $20 to $99. We’ve called conductor Mirga Gražinyté-Tyla the L.A. Phil’s “secret weapon” before, and we don’t suggest you miss this chance to catch her in action. On October 19, she’ll be conducting Mahler’s Symphony No. 4—said to be his shortest and sweetest symphony—along with Weinberg’s Violin Concerto, and Messiaen’s Un sourire. A pre-show talk with L.A. Phil scholar Eric Bromberger gives some additional context to what you’re about to hear. Tickets are available from $60 to $194. The L.A. Phil New Music Group is throwing it back to the original “fake news,” Orson Welles’ War of the Worlds. In this world premiere of an original commission, composer Annie Gosfield and director Yuval Sharon have collaborated in a performance that uses radio broadcasts and real-life sounds happening live throughout the city of Los Angeles (think: WWII-era air raid sirens that they’ve rewired just for this) and streamed into the concert hall to create a pretty crazy experience that we cannot wait to see come together. 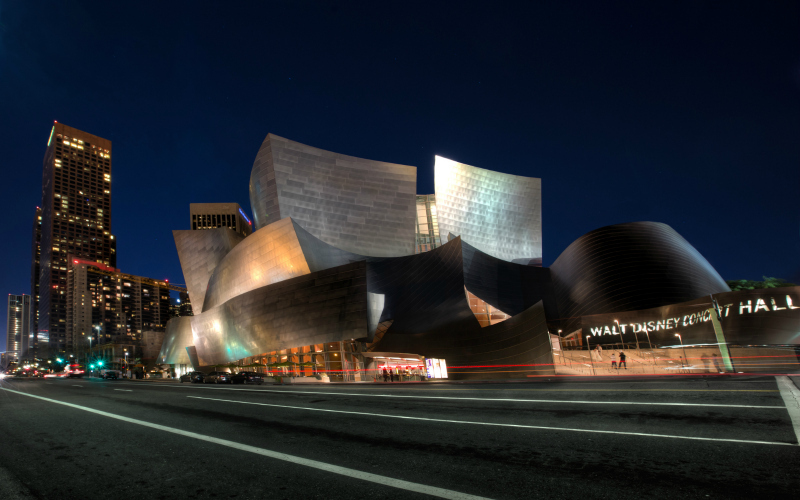 A second performance on November 18 is the centerpiece of this year’s Noon to Midnight, a twelve-hour festival of new music during which attendees are invited to roam the Walt Disney Concert Hall and experience pop-up performances by contemporary ensembles from across the region. Tickets are available for $10 to $49. Hilary Hahn is very good at playing violin. Like, so good, you guys. Time magazine once named her “America’s best classical musician,” she’s won three Grammys, worked on an Oscar-nominated film score, and has had more albums debut on a Bilboard top ten list than Taylor Swift and Kanye West combined. And if you’re wondering how she’s seemingly done it all by age 37, it might help to remember that she started playing violin at just 3 years old. (What were you even doing at 3, huh?) This run of shows is part of a worldwide celebration of the centennial of composer Leonard Bernstein, with Hahn playing a concertante inspired by Plato’s discourses on love. Tickets range from $60 to $194. For the Songbook Series, the Disney Concert Hall is welcoming three pretty well-known and generally-beloved voices to the stage. In December, hear Hamilton‘s Tony-winning break-out star Leslie Odom Jr. performing songs from his recent solo album and some holiday tunes with the help of a jazzy little four-piece combo. Next, Glen Hasard (of Once fame) will play with a full orchestra backing his emotional songs. To close out the series, Art Garfunkel (one of the top two members of Simon and Garfunkel) will perform songs spanning his solo and duo career, as well as staging readings from his recent poetry collections. Tickets are available from $48 to $120. Oh, you thought Traveling Wilburys was a supergroup? Allow us to introduce you to a seriously super supergroup: Ma-Kavakos-Ax is Emanuel Ax on piano, Leonida Kavakos on violin, and, on the cello, the all-time favorite, your man Yo-Yo Ma. Boom. The L.A. Phil files this concert under their “Celebrity Series” because, obviously. Classical music doesn’t get bigger names than this, let alone playing together. Be there as they bring the house down with some Brahms piano trios. Tickets run $58 to $137. Yes, there are two Gustav Mahler programs that make this list, but hear us out. This one, conducted by Gustavo Dudamel, features the composer’s 63-minute, Chinese-poetry-inspired, not-quite-a-symphony, not-quite-an-opera piece, Song of the Earth. What really makes this production special is a collaboration with Chilean theater company TEATROCINEMA, who are noted for innovative stagings that combine video and visual installations with live performance. Tickets available for $60 to $194.